Part of the reason I took a pledge to drink only MN beer for 1 year was to really focus on what makes Minnesota brewed beers special. Who better to shed some light on this, than Minnesota brewers themselves? 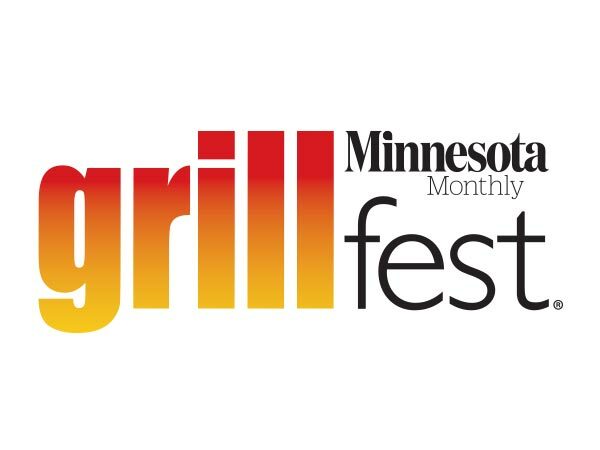 In an effort to get some more insight I will be attempting to interview some of Minnesota’s finest brewers from breweries across the state. My first interview is with Clint MacFarlane, owner and brewer at Castle Danger Brewery. Castle Danger recently got some great press in the City Pages Beer Blog for their planned expansion. I had the honor to intern with Clint during my last year of college, and loved every minute of it. 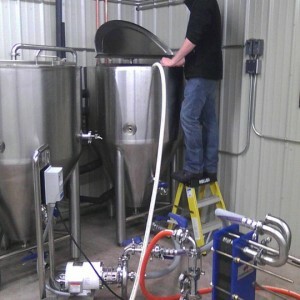 I got to witness a small part of what it takes to start up a new brewery in Minnesota. Clint also let me help out a little bit with creating the recipe for Castle Cream Ale. This was one of the best experiences of my life and really helped shape my passion for brewing, but there will be a later post to come all about my time with Castle Danger. Brewing Experience: 5 years of home brewing and 2 years professional. I generally don’t have a “favorite” beer. I am always trying out new ones, but Odell’s Mercenary makes a fairly frequent visit to my fridge. I love the tropical fruit notes in that beer. Who are your brewing influences and/or role models? I have many influences when it comes brewing. Some are ingredient driven, wanting to use local flare like maple syrup, wild rice or Spruce tips. It is always exciting to use an odd ingredient in beer and try to pair it with a style. Others can be wanting to brew a style you enjoy, but then adding your own twist to it. Of course there is also that beer you try and you say “damn they nailed this beer” now I can move on to something else. There are many brewers and breweries that I admire, and can look at, and really appreciate what they are doing. Not only their beers but also how they run their businesses. On a national scale Odell’s comes to mind, they have definitely figured out my taste buds. Locally the bench marks are Summit, Surly, and Schell’s. What is your most favorite beer to brew and why? 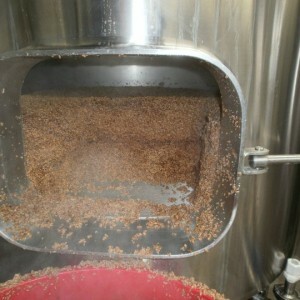 What is your favorite aspect of making beer? Coming up with new recipes is probably the most fun, but also the end result, BEER! 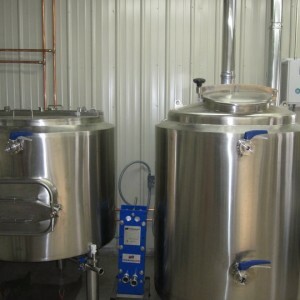 When did you know that you wanted to be a professional brewer? Why did you decide to make it your career? It was probably right around the three year mark into homebrewing when I started thinking about starting a brewery. It was evident right away that I enjoyed brewing and obviously the end result. It was more matter of fact than a dream I had been pining over, however, it did take me a year to convince my better half that it was a good idea. I never planned on it becoming what it is or what it will hopefully be in the future. It was more of a want to have enough beer for friends and family and possibly sell enough to break even. It was going to be more of an extension of home brewing for me. Like any hobby you get into, you either lose interest after a while, or it goes the other way. The latter happened to me, it is now in my blood. I am lucky enough to have found this second passion in life, my first was music. I played bass guitar, wrote songs and sang in a few punk bands growing up. We never really got past the garage but I loved everything about it, and still do, but beer has taken over. Beer has that very creative side to it, just like song writing. To me, a passion is something you will want to do full-time if you can. I am better at brewing beer, and beer has a much wider appeal than punk rock. Right now we just don’t have enough beer, or space. We need to be careful of how many accounts we take on. In the winter when it is slow we could add more accounts and keep up our brewing pace, but because we have no room for extra capacity, we would definitely run accounts out of beer during the summer months when things get busy. That can put a bad taste in a bar owners mouth, so we just don’t do that. What advice would you give to somebody that wants to join the industry? There are many ways. People will tell you, whether it comes from an account saying how people like the beer, someone on the street, or in the tasting room. One of the biggest is a returning regular to the tasting room, these are the people the continually come in for a growler or to taste a new beer. The rating sites Untapped, Beer Advocate, and Rate Beer can be helpful. Although you will have to choose and pick what is helpful and what is not on those sites. What I mean by that is someone who rates your beer at a beer tasting after they have had 15 or more samples may not be an accurate meter. What is one aspect of making beer that most consumers don’t understand? What do you think is special about Minnesota beer? I think Minnesotans as a whole are independent, against-the-grain kind of folks, and I think our brewers are no different. A lot of the new brewers are coming from the homebrewing side of the fence, and home brewing really embraces experimentation. We might be brewing a base style, but I think we all want to put our own stamp on what we are doing. 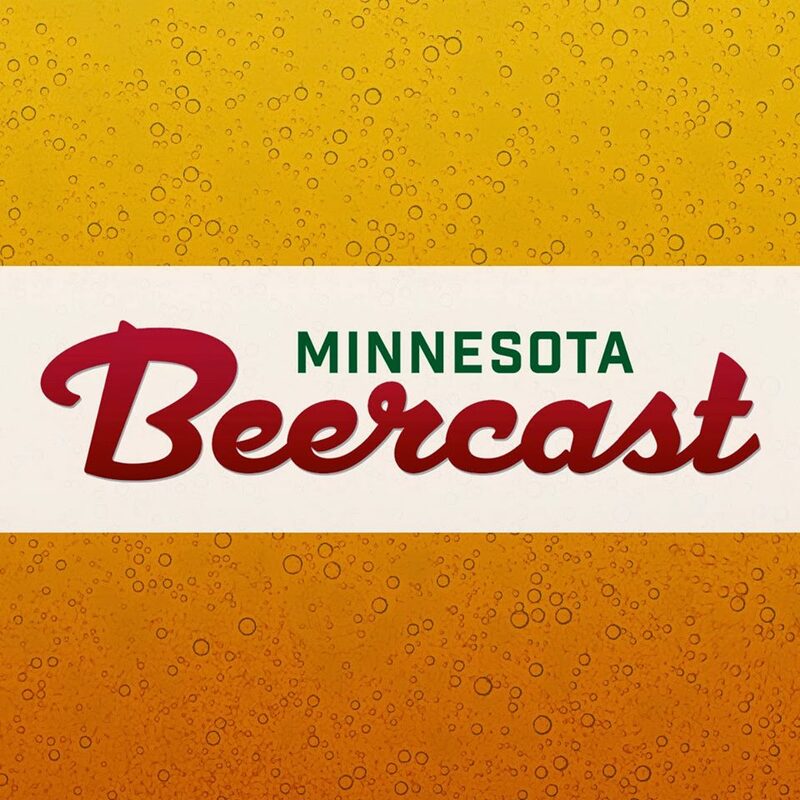 What excites you about the future of beer in Minnesota? The people of our State are the most exciting thing about the future of Minnesota Beer. They are driving the growth of all of us, it will take a while but I think Minnesota can be like a Colorado or Washington State. The fact that there is so many new breweries opening up all around the same time. We all get to essentially “grow up” together, along with the beer drinking public of Minnesota. Of course Minnesota has had some form of craft beer/breweries for some time, but not like the current explosion of recently opened breweries. We are all in our infancy so to speak, when we as brewers “mature” I think we will see more and more world class breweries in our State. Why is it important to drink local beer? Drinking local keeps your local breweries brewing, which means a few more jobs in the community. Typically breweries like to be involved in their own community’s and give support when they can. The beer is better fresh! What if local beer isn’t good? It can be a problem for someone who has not yet tried a local craft beer before, it can turn them off. They might not be as willing to try another local beer. The positive side of this argument is how many local beers are out there and how mainstream it has become. We will get a lot of patrons into the brewery that have never been to a brewery and simply just want to check it out. They might not care for all the styles, but generally I will hear them say “Oh, so and so would like this, we will have to tell them about this place.” People are now aware of how many local options there are, so if they do try one they don’t like, they know there is another brewery around the corner to try next. The more breweries there are the better, it forces brewers to make better beer. At the end of the day if a brewery is putting out sub-par beer, I believe it will work itself out. Where is your favorite place to try new local beer? Anywhere I can! I don’t get out often, but when I do I am always looking for that new brewery or beer that I have not tried.